The incompatibility between 32 bit Microsoft Office database systems and 64 bit Revit program architecture have been causing headaches for a while, but this technical solution may provide the answer you have been looking for: how to get 64 bit database drivers running alongside 32 bit Office installation. In response to my post about Using RDB Link to Tag Wall Volume, Julien Benoit has posted a few helpful comments. He also referred to his post on RFO. Check out screencast embedded below. Thanks Julien! Revit doesn’t let you tag Wall Volume by default, so Avisotskiy puts RDBLink to good use – he uses Microsoft Access to update a Shared Parameter with the wall Volume data, and then simply uses a tag to grab the manually updated and manually created Volume data. This is not a ‘live’ link, but it shouldn’t take too long to round trip the project to update the Volume information prior to document transmission or printing. Revit does not allow to directly make a mark in the volume of the object. 4. 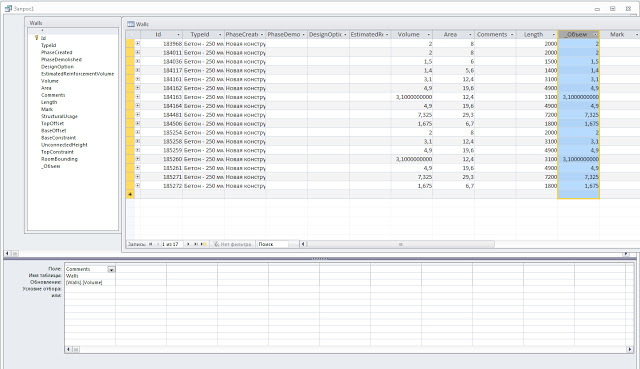 Unload in Access, using the Query Designer update the “_Obem”, taking data from the parameter “Volume”. 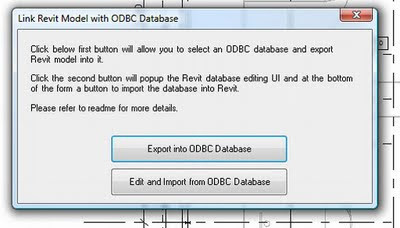 Now, from revit-pl.typepad.com we get a review of how to use DB Link to get a Revit model into access, then modify and update the database using Excel. … the task of directing the attitude of these parameters that all poles have become a consistent shape, eg by one by one appropriately “shrunk” towards the top, according to a chart linear function. First Saving the model into a format read by MS Access ®. Second Modifying the parameters using the formulas family excelowskich and update the model. There are a few videos at the original post. can also be used to export data, renumber sheets, and place views on sheets. A relatively complex and highly developed program that can be the basis of a wide range of workflows. 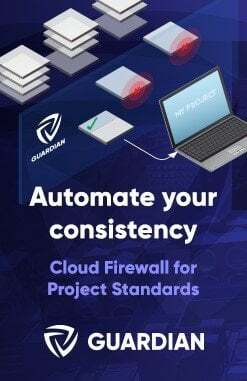 It can connect to either an Access or a SQL Server database and synchronize data in both directions. Placing unplaced areas and rooms. Creating views, adding tags, and exporting images. Exporting detailed information about families to Excel. The RDBLink method establishes a bi-directional database which can be edited and updated. Be careful when using this. I would recommend trying it on a test project before actually putting it into use. Download the RDB Link Tool and install it. Setup a DSN source in Windows. 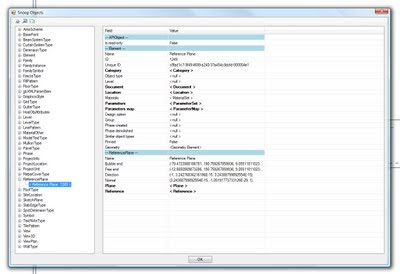 Export your Revit file to the appropriate database. View and edit the database. Update the project with the edited database. Click the System DSN tab. Put a name in the Data Source Name (revit1 for instance). 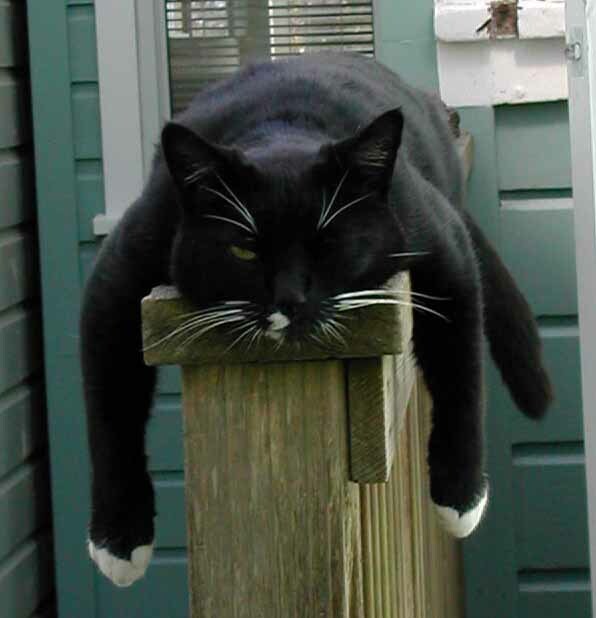 Put a description. Click OK until you are out of the ODBC Data Source Adminstrator. 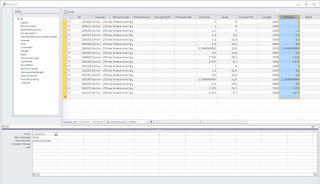 Click the appropriate Data Source tab, and locate the Data Source Name you created, which is set up to connect to an existing Access or SQL Server database. If you selected an Access database DSN, a Login screen asks for a name and password. Leave it blank if you have not specified a user name and password for your database. Open the database in Microsoft Access and have a play. Modify a wall height or something and save your changes. Back in the project, use the RDB Link tool to import the data from the same database you exported to. Have a look at the change in your model! 1. Launch the Windows Data Sources (ODBC) screen from the Start menu>Programs>Administrative Tools section. 2. In the ODBC Data Source Administrator, select either User DSN or System DSN to create a new data source name for your database to use with RDB Link. Specify the Data Source Name of your choosing. Click the Select button to select an existing Access database or the Create button to create a new one. Fill out the information appropriate to your version of SQL Server. Ooh La La! Does Revit really want you to see what goes on under the hood? 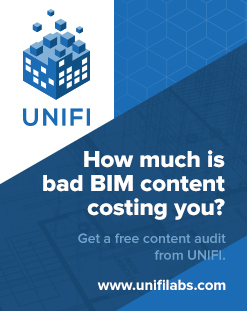 Well, if it can help you understand Revit better, then I would suggest that it does (because it will help you know how to ‘treat Revit right’). So, how do you do it? This is the most comprehensive method, in that it allows you to ‘Snoop’ virtually all parts of the Revit database. This method actually allows you to modify and then update Revit model element properties. Both of these methods expose the Revit database, which allows you see how things really go together. The Revit database is really what makes everything else possible: from environmental analysis to the basic parametric nature of elements. It’s exciting stuff!I will do individual posts on how to setup and use both these methods in the near future.